Obituary – Jones Jr., Frank Marley « Perry High School Alumni Association, Inc.
– is the son of Mr. and Mrs. Frank Jones, 711 Delaware street, and is 19 years old. He was born in Perry July 24, 1920. Before attending the Perry school he attended the St. Joseph’s Academy here. 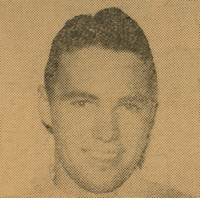 Frank was a member of the high school football team for four years playing fullback and served as co-captain for two years. He played on the high school basketball team in 1938 and wrestled in 1937. In 1939 he was chosen as All-Northern Quarterback. During his senior year he was vice-president of his home room class. Hunting and fishing are his hobbies. Next year he plans to attend Central State College in Edmond. 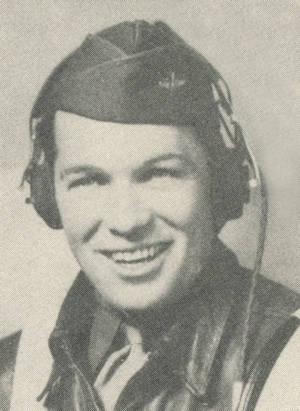 Lt. Frank Marley Jones, Jr., 21 year-old son of Mr. and Mrs. F. M. Jones, 711 Delaware, Perry, was killed when a Flying Fortress in which he was a bombardier crashed into a rugged mountain peak 50 miles north of Van Horn, Texas, May 30, 1943. Funeral services will be held at 9 o’clock Friday morning in the St. Rose of Lima Catholic church with Rev. William Reid, Pastor, officiating. Burial, under the direct of Newton funeral home, will follow in the Catholic cemetery. Rosary for the serviceman will be said Thursday night at 8:30 in the church. Pallbearers Friday morning will be Kenneth Burke, Gene Dauman, Alvin Cockrum, Verdis Swart of the air force, Paul Hicks of the U.S. navy, all of whom played football on Perry high school teams with Lieutenant Jones, and Herman “Katz” Eisenhauer. Jones was born July 24, 1920 in Perry. He attended St. Joseph’s Academy, and was a 1940 graduate of Perry high school. Lieutenant Jones ended three years in the national guard in 1940 when he rejoined the guard for a similar service term. Men in the guard became soldiers in the regular army, and Jones began training in the field artillery of the 45th division. Stationed first at Fort Sill and then Camp Barkeley, Texas, he was transferred to Fort Devens, Mass., where he enlisted in the army air corps. After about a month at a classification center, Nashville, Tenn., he was sent to Ellington Field, Huston, Texas. Her received his second lieutenant’s commission at San Angelo field, Texas, April 1 and was sent to Rattlesnake Bomber base, Pyote, Texas. He was training with a crew of 11 men, who were soon to go into active foreign duty together, when their Flying Fortress bomber crashed. He is survived by his wife, the former Virginia Dufek, his parents and two sister, Mrs. Earl Wilson of Bristow and Pat of the home.